By now I am sure that most everyone has heard about the split of Sage Sparrow into (at present) two species: Bell’s Sparrow (Artemisiospiza belli) and Sagebrush Sparrow (A. nevadensis), two names I think are appropriate or at least I can’t think of anything else better. Bell’s has multiple subspecies within it and for the purposes of this blog post, all mention of Bell’s Sparrow refers to A. b. canescens. It is interesting to note that this split is not without its detractors and it is well worth reading the proposal, as well as the literature cited. Especially worth reading is Patten and Unitt 2002 (claims that canescens is not a valid taxa and should be lumped with nevadensis) and Cicero and Johnson 2006 (which is a rebuttal to the prior paper’s claims). Really it is a good idea to read over all proposals you have an interest in, as well as any of the publications you can get your hands on (important parts of which can be left out of the proposals). Read it and decide for yourself if you agree with the committee decision! I know I don’t always agree with the decisions, but after reading the material present and committee comments, I can at least usually understand the rationale behind it. Anyway I’m getting way off the topic of Sage Sparrows. The main reason for this post is that the LCRV is one of the few places were both species can occur. This can present a great opportunity to study each species, as well as for listing with the LCRV being one of the best places for Bell’s Sparrow in Arizona, as well as Sagebrush in California. Within the LCRV, though, both taxa are reported to occur, but it is not known the exact status of each species. We have not seen many “Sage” Sparrows in the LCRV, but Rosenberg et al 1991 reports that they have a preference for inkweed/iodine weed (Suaeda torreyana) which is found in alkaline soils and is a localized habitat we do not visit very often. I know this winter though I will be spending more time in it! I haven’t explored the Blythe area south enough in winter to give good sites there but check ebird.org for good locations there. The Parker Strip is likely your best bet for Sage Sparrows in California, as along the river there are still nice patches of Suaeda. Good spots to check include the brush areas around Quail Hollow Day Use Area and the Crossroads Campground. I’ve had birds matching Bell’s Sparrow at both spots (but see below on problems of identification). On the Arizona Side your best bets are probably Pintail Slough on the Havasu NWR where I’ve also had birds matching Bell’s. I’ve had them once in the Parker Valley and it is likely still worth checking, but that area has lost a lot of habitat to agriculture which is typically unsuitable for Sage Sparrow. Kohen Ranch in the Bill Williams River NWR is another site I have had the species and is worth the hike in winter to check out. Interestingly these areas all have a lot of Atriplex (saltbush) which Bell’s Sparrow breeds in, perhaps there is some ecological partitioning on the wintering grounds? Bell’s Sparrow is more local in Arizona than in California and the reverse is true of Sagebrush Sparrow. Bell’s Sparrow does not breed in Arizona, but Sagebrush Sparrow does breed in the Great Basin portion of California. Both species winter in the Salton Sink, but like the the LCRV the status of each has yet to be worked out. 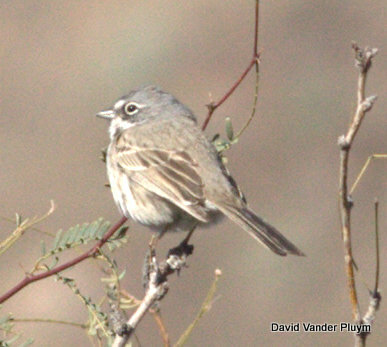 The status of Sagbrush Sparrow as a migrant (and possibly in winter) in the Mojave Desert is largely unknown. 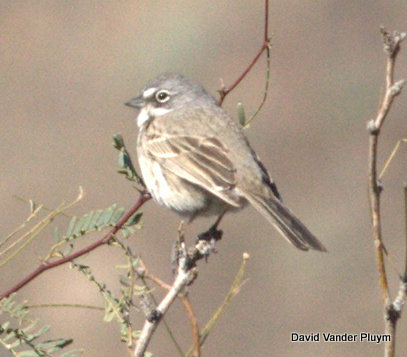 Within the Arizona portion of the Mohave Desert at places such as the Sacramento Valley it appears to be largely Sagebrush Sparrow (again see comments on ID below). Bell’s Sparrow has been found east to Phoenix in Arizona, but how regular is it east of the LCRV? Given how new this split is and given the wide range of opinions as to how identifiable in the field the two taxa are, the following paragraph on identification should be considered tentative and in need of further evaluation. The papers used to split the two have cited morphological differences in the form of size, but little on plumage. One thing that is known is that both species molt before they reach the wintering grounds, so once present in the LCRV they should be at their freshest. Below I will review some of the field marks I have seen mentioned. Currently measurements are considered to be the most reliable way to identify the two species, I think however that the two are identifiable in the field though identification may be difficult especially when the two are worn in summer. The head/malar contrast of birds in the LCRV do seem to differ from those just east of there and some unscientific looking at photos online I am able to identify the majority of birds correctly. At this point I should note that of the field marks discussed below, Patten and Unitt 2002 only used measurements (which they did find largely differed), mantle shade, and presence of back streaking. Things like malar/head contrast were not evaluated. I should also mention that though hybridization appears to be rare (hence why they were split) my understanding is that it does occur. Contrast between the head and the malar stripe, along with the strength of the malar seems to be one of the most reliable fields marks. On Bell’s Sparrow the malar is darker than the head while on Sagebrush it is about the same shade. Bell’s Sparrow also has a thicker malar strip than Sagebrush. Head coloration may be useful, but I think how dark the head is can be difficult to judge and it is better to use the contrast between the head and the malar. I’ve also seen mention of the darkness of the auriculars, but this seems to be variable. Back streaking and mantle shade: Both the amount and the boldness of streaking on the back may be useful, but there appears to be overlap, possibly only extremes may be identified using this field mark, or it may be useful in conjunction with other field marks. It may also be more useful when they are fresh as photos online of birds on the wintering grounds seem to have a more noticeable difference than photos from the breeding grounds. Some fresh birds do seem to differ in mantle shade, but again it seems to be wear related and a lot of overlap. Primary projection maybe be useful as well, as the wing length measurements differ between the two. However this can be difficult to use in the field and needs further examination. Underpart streaking and coloration has been cited as a field mark, but this seems to be variable and I haven’t noticed any real difference looking at photos. Prominence of a supercilium has been cited, but this seems to be variable as well, a complete lack of any pale area in the supercilium may be only found in Bell’s, but this could be nearly impossible to tell without a bird in the hand. Amount of white in the tail has been cited as a field mark for Sagebrush vs nominate Bell’s. Though it is variable the amount of white (Sagebrush) vs buffy (Bell’s) in the outermost rectrices may be of some use. Another field mark that if useful would likely be difficult to use in the field. Caution is warranted as we learn about identification of the two species, and for the time being it may be best to leave most birds on the winter grounds as “Sage” Sparrow or use the modifier presumed/probably. That being said with practice I think most individuals are identifiable in the field. Check out this photo of a Bell’s Sparrow and this one of a Sagebursh Sparrow posted online. Notice the head color in both individuals and despite the photo of the Sagebrush Sparrow looking like it has a darker head, the contrast between the head and the malar is minimal. The Bell’s Sparrow shows a strong contrast between the malar and the head. Notice also the amount of streaking on the back of each individual; this characteristic, though, needs further evaluation and should be used possibly only as a supporting characteristic. Robert Royse’s webpage has a nice selection of both species (along with nominate Bell’s Sparrow), though more location data would be useful to assure yourself that they couldn’t have been a different taxa than that listed. I also recommend checking out this earbirding.com post on the identification by song. Finally Birding is Fun has a nice review of the split. It may take a while to fully figure out the field marks of these two species, but I think we will come to a better understanding of identification. Remember how impossible other splits were thought to be (like Cackling Goose)? I don’t think this is going to be a “Western” Flycatcher type split, but one that with time we will come to better understand. Course I could always be wrong only time will tell! Rosenberg, K.V., et al. 1991. Birds of the lower Colorado River Valley. The University of Arizona Press, Tuscon, Az. This entry was posted in Birding Locations, Havasu NWR, High desert, Identification, Imperial County, La Paz County, LCRV, Mohave County, San Bernardino County, Species Profiles, Uncategorized and tagged Arizona, California, LCRV, Mojave Desert, Sage Sparrow, Salton Sink. Bookmark the permalink. So then, if I saw a (then) Sage Sparrow in Wilcox in January, it would now be the Bell’s Sparrow? How about a Sage Sparrow in July at the Vermillion Cliffs? Would that still be a Bell’s? Both of those would be Sagebrush Sparrow. Bell’s in winter hasn’t been recorded east of Phoenix and Sagebrush is the only one that breeds in Az. David, thank you for a detailed post concerning this split. This will be a challenge at first, but as you pointed out, I think it will become easier to discern the differences over time, especially if a person gets out there and observes them as frequent as possible. Thanks again!